Where will the road of life take you? 2015 is off to one heck of a start. It has already brought about some huge changes. 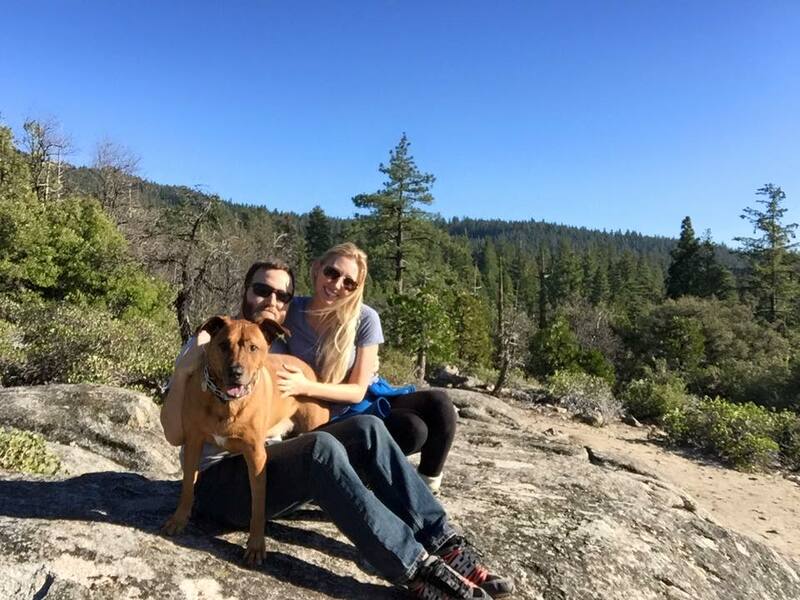 My husband and I made the move from Washington to Northern California, and the prepping and planning of the move has kept us crazy busy for the past few months. Big moves, or any big life change for that matter, can be stressful, exciting, and a bit sad too. California is very different from Washington, and while my husband and I had spent some time living in the southern part of the state several years ago, we were fairly unfamiliar with the northern half. We tackled this move with good attitudes, ready for whatever it might bring. The name of the game is adventure: the adventure of moving to a new place, of leaving things and people behind and of forging ahead to create a new life; the adventure of not knowing what lies ahead; the adventure of discovering new areas to play and roam in; and seeking out adventure wherever it can be found. Our free time has been spent exploring and getting to know our new surroundings. For us, being outdoors and spending time climbing in the mountains and fly fishing on creeks and rivers is of the utmost importance. So the first thing we did on our first weekend off in our new home was to hop in our car and scope out our surroundings. Together, with our little dog in the back seat, we sought out new places to get out in the wild. 2. Seek out places and things that you love. Get acquainted with the new areas in which you will spend your time and can live out your passions in. 3. Establish a new routine. 4. Find the beauty around you. Find the adventure around you. Explore. Do you ever get in a recipe-rut where you fall into the habit of making the same old things for dinner time after time? I sure do. But some times I get the urge to really put in some effort and make something special. 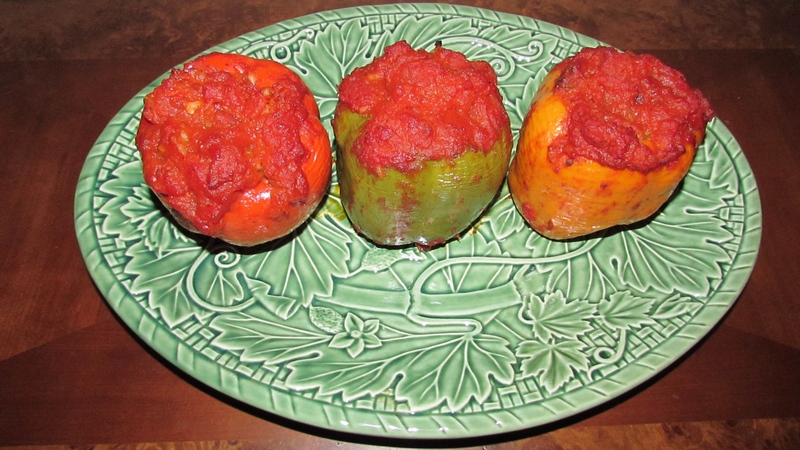 If you’re feeling adventurous, give these Stuffed Bell Peppers a try for dinner tonight. They are easy, healthy, and tasty. Preheat the oven to 350 degrees Farenheit. Combine the ground bison, the chopped onions, and the minced garlic in a skillet and cook until the bison is evenly brown and the onions are soft. Remove the tops, seeds, and membranes from the bell peppers and set them top up in a shallow baking dish. If the peppers wont stand up on their own, you can trim off pieces of the bottom to make a flat base. Mix the browned bison, onions, garlic, rice, one 8 oz can of tomato sauce, and the Worcestershire sauce in a large mixing bowl. Spoon the mixture evenly into each bell pepper. There will be left over mixture. You can save it for a fajita type deal, or you can go ahead and add another bell pepper to this recipe and stuff a fourth one. Up to you. Pour the remaining 8 oz can of tomato sauce over the top of the bell peppers. You will use this sauce to baste the bell peppers every 15 minutes as they cook. Stick the baking dish with the bell peppers into the oven. Cook at 350 for about one hour, basting the bell peppers every 15 minutes with the sauce. 1. Drink water. No…I mean LOTS of water. Our bodies are primarily made up of water. When you feel yourself becoming thirsty, that means that your body is already in the beginning stages of dehydration. It is recommended that you drink water constantly throughout the day rather than waiting until you feel parched. I keep a 22oz bottle with me, and I try to drink at least three bottles full of water each day. Ideally, one should be drinking at least half of one’s body weight in water every 24 hours. Water helps to flush toxins out of your body, and, most importantly, your skin. If you start amping up your water intake, I bet you will notice your skin start to clear up and, before long, it will take on that greatly coveted natural glow. *Bonus: Drinking more water will give you energy! 2. Coconut Oil. I have found that coconut oil makes an incredible, all natural moisturizer. It can be used all over your body, like a lotion – minus the chemical ingredients. Coconut oil is a wonderful lip balm, and it makes your skin positively glow. It’s also great to use in your hair as a conditioner. Just smooth it into your strands before a shower, and let it sit for a few minutes before washing it out. 3. Limit Dairy. I’ve been trying to limit my dairy intake and since I’ve done that, my skin has become less bumpy and more smooth. 4. Stock Up On ZZZZs. Getting a solid 8 hours of sleep every night is a crucial part of a natural beauty regimen. When you sleep, your body repairs itself. Your mind, your skin, every single part of you is worked on while you sleep. Getting enough sleep reduces dark circles under your eyes, adds to your natural glow, and helps to reduce cortisol levels (which are caused by stress). Investing in some quality sleep is a good idea whenever you can. 5. Exercise! Whether it is a relaxing yoga class, a nice run outside, a fast-paced barre class [my favorite barre workout is barre3: www.barre3.com], or a full-body toning video from the girls over at Tone it Up! [www.toneitup.com]. It doesn’t matter what you do. Find something you love that makes you feel good about yourself, and then make it a habit! 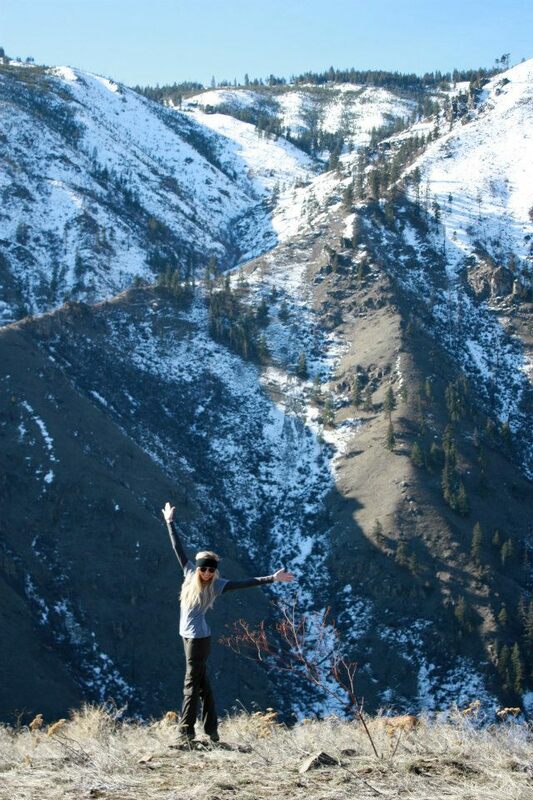 My favorite form of exercise is hiking. What’s yours? Exercise will increase circulation in your body, and it helps pump oxygen to your organs. And don’t forget, what is the largest organ in the body? That’s right – skin. Exercise will make your skin healthier. And that’s what we’re going for with this natural beauty regimen! So even if you just do a Tone it Up video for 15 minutes, or an hour-long barre3 class, that’s ok. As long as you are doing something good for yourself to get your body moving a little, that can do wonders for your body and, especially, your mind. Exercise reduces cortisol levels, keeps you limber, and gives you endorphins which make you happy. And happiness is beautiful! 6. Relax. I’ve been mentioning cortisol – that nasty chemical that is released in your body when you are stressed. Too much cortisol can have detrimental effects on your health. Try to make an effort to relax and let go of stress. Take a hot, candle lit bath with your favorite bath soaps. Go on a weekend getaway with your honey. Curl up by the fire with a good book and zone out for a while. Get a massage, or a manicure and pedicure. Drink some tea, or a glass of vino and just…let go every once in a while. It will do wonders for your body…and your mental health. 7. Pay Attention to What Kind of Food You Eat. I’ve tried to focus on eating whole foods and I have been making an effort to eliminate processed foods from my diet. When you think about it, processed foods are hardly food at all. They are modified, filled with chemicals, salt, and sugar, all in an effort to appeal to the taste buds, while completely disregarding what they do to our bodies. By sticking to whole foods, you can be more sure of what is going into your body. Fruits, vegetables, meat, fish…these are all things that are in their natural forms. Stick to those types of foods. Your body will thank you for it. Five Ways to Get Outside – No Excuses! 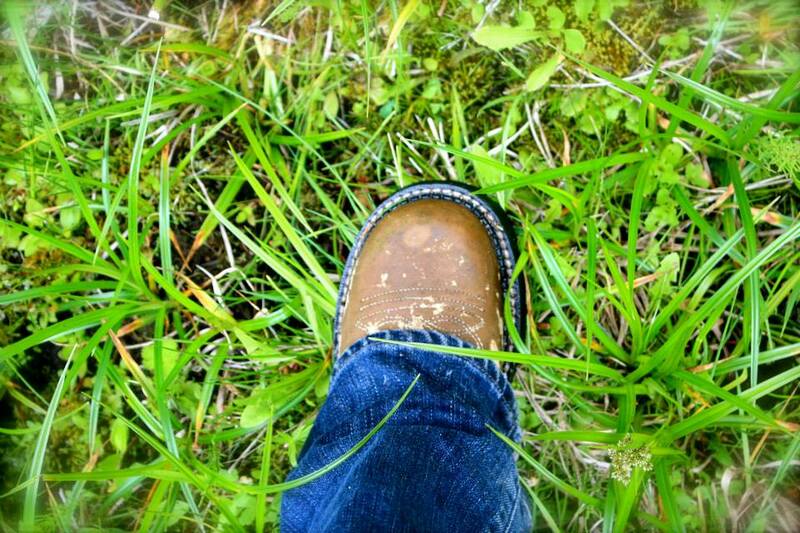 Pull on those adventure-boots and get outside! 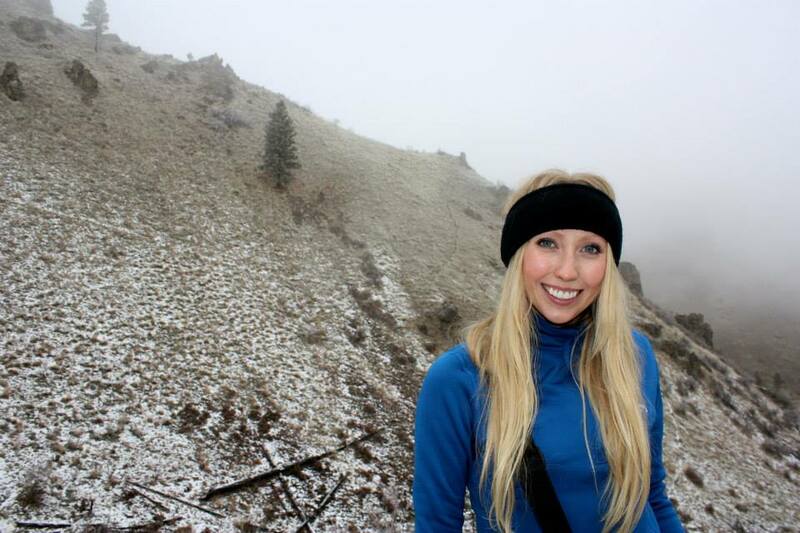 I am all about getting outside, doing something adventurous, trying new things, staying active, and pushing my limits. I think everyone should! The world is such a big, beautiful place just waiting to be explored. There is so much out there in nature that we can (and should!) take advantage of. Now, I know some people who are used to watching tv on the weekends and going to the nearest mall for entertainment might not know quite where to start when it comes to getting outside and enjoying the great outdoors. Six years ago I wouldn’t have known where to start either. Outdoor activities seemed fairly unattainable and, frankly, undesirable. Too much work, dirt, and risk. However, over the past few years I have learned that getting outside is not only GOOD for a person’s mind, body, and soul, but it can be easy and oh-so-fun! So, for those of you who just need some ideas of where to start, here you go. Five ways to get outside and enjoy the bountiful playground of the wild! 1. Go hiking! Such great exercise, AND you get to breathe in the fresh air of the great outdoors. 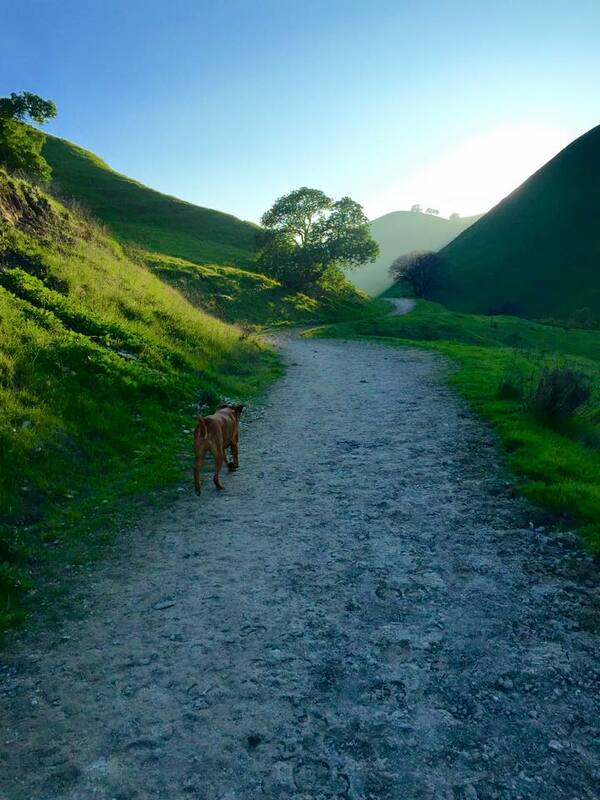 Get away from the hustle and bustle of the malls and the crowds; get off your couch; grab a friend, or go alone… There are so many trails out there. Just Google hiking trails in your area and I guarantee you will find some great options, regardless of your skill level. Whether it’s a short little walk through the woods, a 5 mile trek up a mountain, or a 3 day backpacking trip in the back country, getting moving and exploring in the great outdoors will do you good. 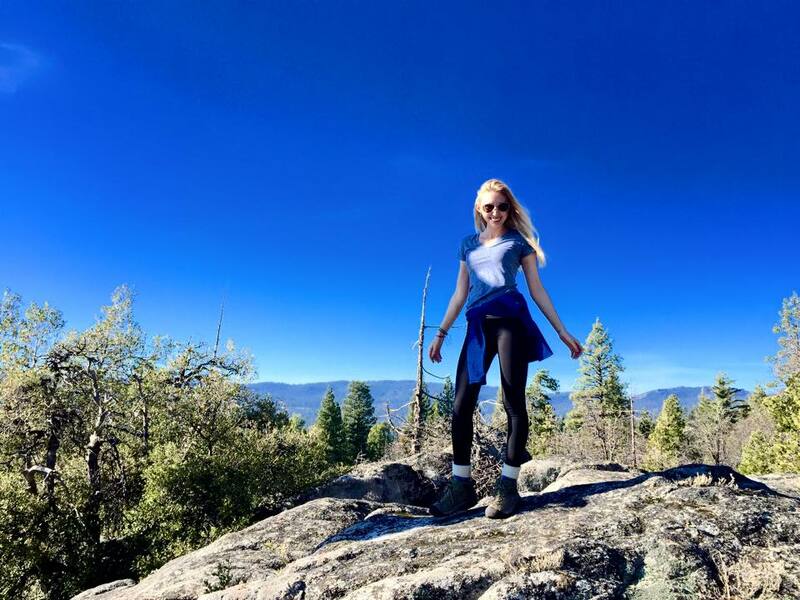 I would argue that there is hardly anything better for you than getting out into nature, walking through a forest or up a mountain, connecting with the wild, breathing in the pure air, and getting some exercise. Plus, making it to the end of a trail is such a rewarding experience! You will be proud of yourself AND the view from the top is almost ALWAYS worth the sweat. 2. Ride a bike! If you don’t have one, rent one! Pick your desired level of intensity and gogogo! Go for a nice, level ride on a paved path, or pick a mountain and charge it. Get out there, test your limits. Put the pedal to the metal! 3. SUP! 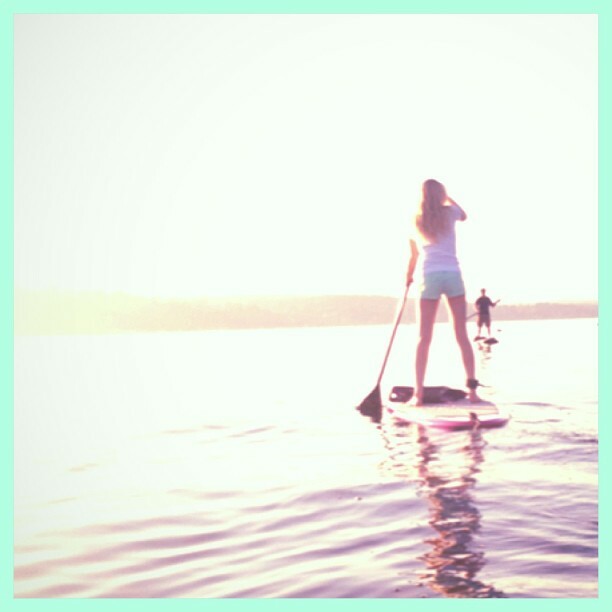 Stand Up Paddleboarding is one of my new favorite things to do. It is an excellent source of exercise for your whole body, AND it allows you to get out on the water anywhere there is a body of water near by. There is something so relaxing and grounding about being out on the water on a paddleboard. Whether you are catching waves in the ocean, or cutting across a glassy lake, you will get a good work out AND get outside. You can paddleboard all year round too. 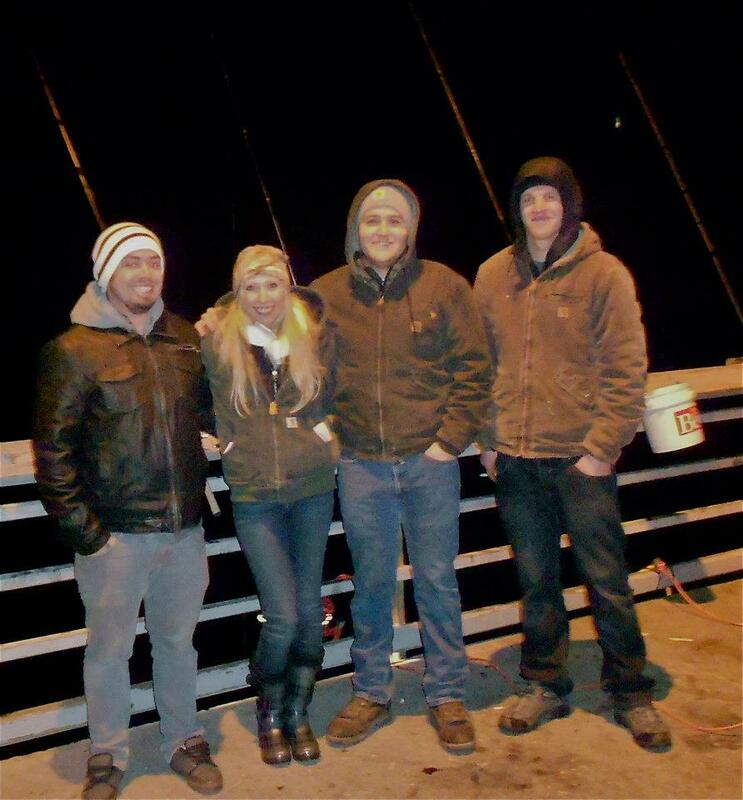 Just bundle up in the winter time and hit the lake. I love being out on the water on a clear, calm, winter day. You can rent paddleboards all over the place. Again, just Google SUP rentals in your area. My board is from Perfect Wave Surf Shop [www.perfectwave.com]. 4. Bouldering! What is bouldering, you might ask? Well, it is a form of rock climbing that does not use ropes or harnesses. Raw, baby. Just you, gripping a rock wall with your bare hands. Talk about extreme. This is a great way to test yourself and push yourself to new limits. Conquer your fear! I’m terrified of heights, but hey, what better way to get over that than to climb a rock wall with no safety net? Best part about it: no gear required! Worst part about it: no gear required! 5. Go fishing! Fishing is a huge passion of mine. I am a fly fisher-woman myself, but there are all different kinds of fishing that you can learn. Whether you hit the nearest lake with a spinning reel and some PowerBait, or go squid jigging off a pier in the ocean, you are bound to have a great time, especially if you bring a buddy along. 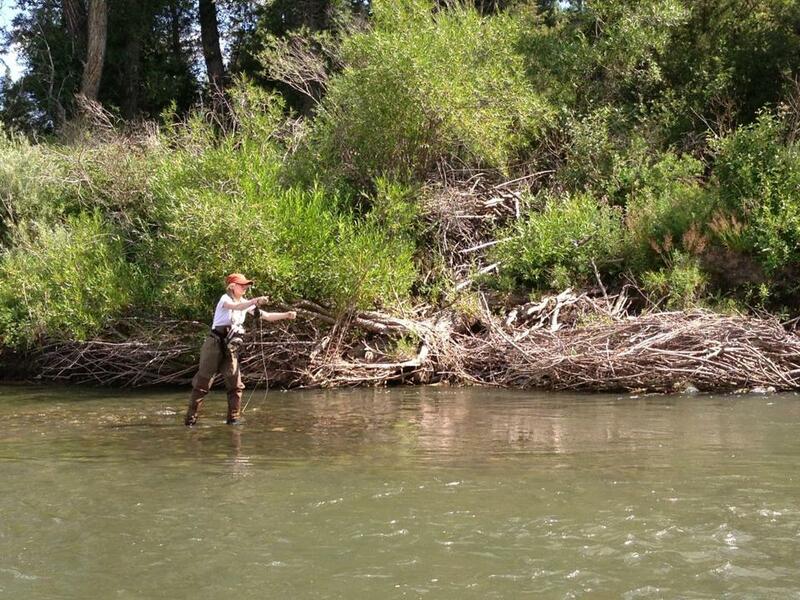 But seriously, try fly fishing…it’s the best. Fly Fishing on the Yellowstone! So, no excuses! There are so many things to try and so many ways to get yourself outside! Go! Have the adventures that you have been yearning for! Make them happen! Push yourself, conquer your fears, and make yourself proud! Want to collaborate? Want me to write for you? Want me to review a product? Have a question? Great great great and great! I will get back to you as soon as possible! Want to collaborate? Want me to write for you? Want me to review a product? Have a question? Great great great and great! Shoot me an e-mail at: anna.mcohen@yahoo.com and I will get back to you as soon as possible!